If you saw our previous news... ignore it, we have been duped! The GTX580 is not a die-shrink after all, it is in fact a new chip codenamed GF110, which retains many of the characteristics of the GTX480, and (finally!) activates all 512 SPs available on the chip. The changes are mainly intended to reduce the power draw/amount of heat produced, as the GTX480s are well known for their hot-running nature. In this respect, the new design seems to have been successful. It has a maximum power draw 6W lower than the GTX480, despite having the additional 32 SPs and running at a stock speed of 772MHz (GTX480 had a default of 700MHz). This operating speed approaches that of the GTS450, the current folders' dream card. 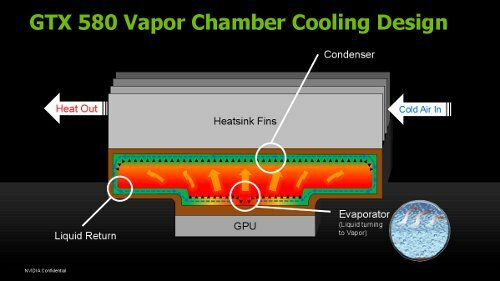 For cooling, nVidia has developed a clever phase-change cooling system, which in practice works the same way as heatpipes in other more standard coolers. It is a very promising GPU for units with large systems (yes, such units have been spoken of for a long time and we are still waiting) but the price may put potential buyers off, as it is set at about €500. On the other hand many sources said that this chip has had some HPC (High Performance Computing) functions removed, to allow the removal of 300 million transistors, so we were curious to see what impact these changes would have on Folding@home. The average gain is 17%. 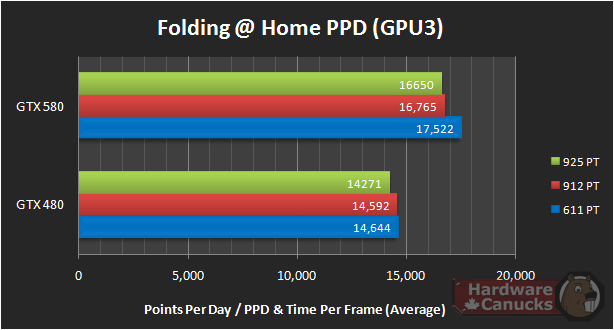 So we can conclude that the removal of the HPC functions has not negatively affected Folding@home performance. Great news! Folding with a Radeon HD6800? Possible, but underwhelming! Is the Sandy Bridge GPU compatible with OpenCL? I like the Vapor-cooling design. Earlier found on Sapphire Vapor-X series of cards and ATI Radeon HD 5970. Since when do the 611pt WUs give more PPD than 9xx WUs? if the one forum i was reading is correct, (forgot where i read it from) The 611p Wu gain performance via the additional cuda cores vs the other work units where they depend more on speed than cuda cores.